If you are looking for something new to add to your bread box – these little beauties are perfect! 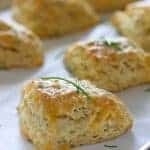 As easy to make as a biscuit but with tons of flavor! 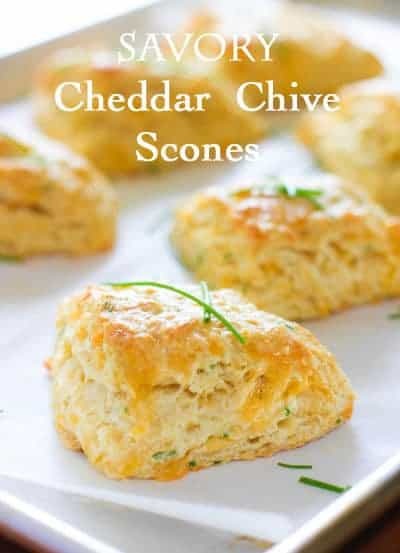 We love these Savory Cheddar and Chive Scones because they are so easy to make! I cut the chives fresh from my own little herb garden. Makes me feel like a farmer when I cut my own herbs. Yup, just me chewing on a piece of straw with a red bandana tied around my neck, cultivating my herb farm. Speaking of herbs…as of yesterday, here in Seattle, purchase of a very popular herb is now legal – maybe that’s what I should grow next year…a bumper crop of happy grass! Okay, maybe a bad idea..I really do not need to be hungrier, stupider or have Cheeto breath. I’ll just stick with chives for now…. Here is a little pic of my herb garden. All legal tender I might add. 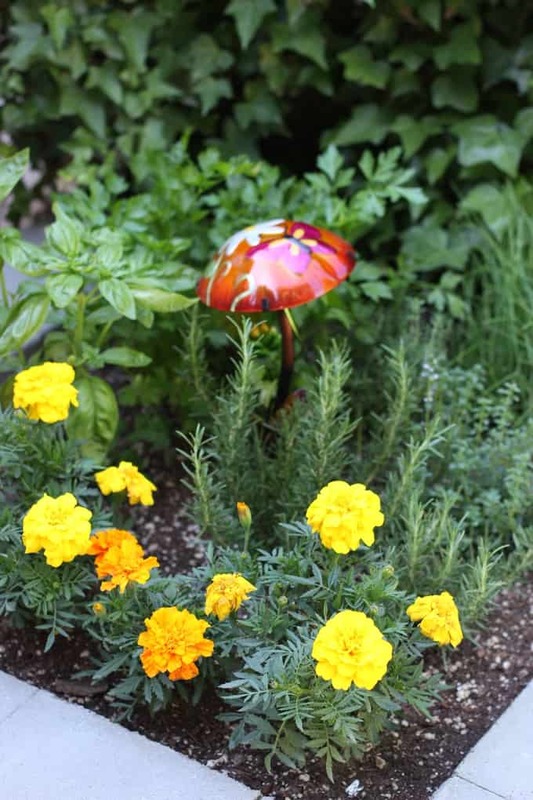 My Mom gave me the cute little mushroom light – I just love it! And someone told me that if I plant marigolds it will keep the slugs at bay andI believe it has worked! Notes – feel free to add your favorite herbs and cheese. Rosemary and Gruyere sound wonderful ! Or how about some happy herbs and Cheeto’s…what the heck, keep it all in one compact scone – save a trip to the refer! Oh, I mean the refrigerator…. And wouldn’t these Scones go great with Easy and Fresh Chicken Parmesan Soup?! Hello – your recipe sounds delicious! I would like to make them as small bite size to serve with drinks. Do you have suggestions of how I would alter your recipe? Hi Laurie, simply adjust the baking time. It would depend on how small the bites were (terrific idea BTW!). So I couldn’t really give you an accurate baking time, but check after 10-12 minutes or so. I’ve made these twice and holy crap they are DELICIOUS. Just wondering, is the egg wash necessary? Hi Kelly – so glad you liked it! The egg wash is just to make them pretty. It really does make a difference in the way they look but no, not necessary to the basic recipe. These were AMAZING! Turned out exactly like the pictures. I added some garlic and black pepper and it was delicious. Hi! Just curious, did you add fresh jalapenos or pickled jalapenos? 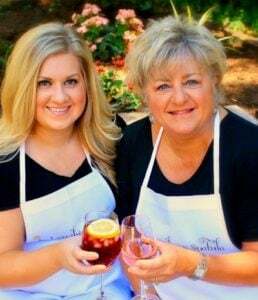 Hi Kathi, I’m very excited to make these for our trip. I will be transporting them on the plane. Silly question, how long do you think they will keep (refrigeration may not be good for them I suppose?). Hello Chelsea! I’d make them the day before and keep them in a ziplock baggie in a cool place. Doesn’t need to be the fridge. I’m excited that my scones are going on vacation! :). Thanks for the reassurance, Kathi. Letting you know your scones were delicious and very much enjoyed by us on vacation. We put them back in the oven for a few min to warm/toast the top a bit after their flight (to Iceland). I look forward to making them again! Hello! Looks like a great recipe I’d like to try. Question … should the dough rest for 10 minutes are room temp or in the refrigerator? Thank you! You sure could! It won’t hurt and in fact you might get a little more lift in your dough. Hope you get a chance to give it a try! These were a big hit for Christmas Day brunch today. I only dabble in scratch baking but with my daughter’s help they turned out great. Definitely bookmarking this recipe. Hi, I just baked these scones and have a question. While it was baking I noticed the fat from cheese seeped out and made pool of oil around the scones. When the baking was done, the bottom of the scones was like deep fried. I wonder if anyone had a similar situation? Hi Sam, it sounds like a cheese problem. Did you use grated cheddar? Could be your cheese had a lot of oil in it. I make these on a regular basis and have not had that problem. wow…this was by far one of the tastiest scones i have ever had. it was easy to make and so yummy. My boys are going to loves these. Thanks! I am so glad you loved them Angela! I am a total savory girl so I’ll take these any day! Thank you for the nice note!